Calgary tightened its grip on top spot in the Pacific Division on Monday night thanks to big nights from its best players. 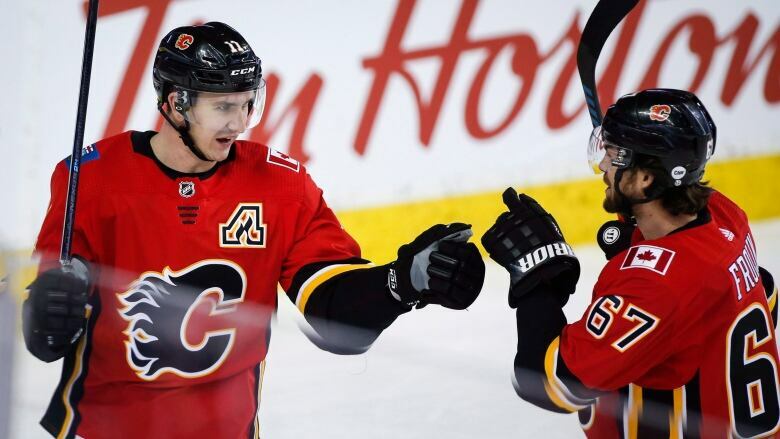 Johnny Gaudreau and Matthew Tkachuk each scored twice and added two assists and Sean Monahan had five helpers to lift the Flames to a thrilling 8-5 win over the San Jose Sharks. Monahan's five-point night was a career high while Gaudreau and Tkachuk tied career bests. "I was happy with the way our team played," said Gaudreau. "It was going back and forth and back and forth for a little, but found a way to take it over in the third and get a big team win." Joonas Donskoi's second of the night, 48 seconds into the third, drew the Sharks back to within a goal at 5-4, but Calgary restored a two-goal cushion just over two minutes later on the first goal in 25 games for Neal. Neal's fourth of the season and first goal since Nov. 1 was a lucky one. Sam Bennett patiently circled the Sharks end with the puck before firing it across the slot and banking it in off Neal's skate. "Great play by Benny and it felt good to see it go in," said Neal, who hit a goal post in the second period. "As of late, when you're getting shots and you're getting back into your groove, I think it's visible, as a player and spectators watching, I think you can see my game start to get going a little bit more. It was a nice break." Goals 41 seconds apart from Gaudreau — his 20th and 21st of the season — made it 8-4 shortly after to put the game away. Calgary never trailed. Mikael Backlund scored 1:10 into the game and after Lukas Radil tied it, Backlund's second of the night at 10:55 gave the Flames the lead again. Elias Lindholm set a career-high with his 18th goal, and also added two assists, to round out the scoring for Calgary (24-12-4). The Flames improved to 8-1-3 in their last dozen games at home. Brent Burns and Joe Thornton also scored for San Jose (21-13-7). The Sharks lost in regulation for just the second time in their last 11 (7-2-2). "Every time we scored, they answered," said Sharks captain Joe Pavelski. "It was one of those weird nights where everything that was directed at the net found the way in." A feisty game throughout, tempers boiled over in the final minute of the game. With 41 seconds left, all 10 skaters on the ice got involved in a melee in the Flames end. Then with 23 seconds left, a late hit from Bennett on Radim Simek crumpled the Sharks defenceman. Barclay Goodrow jumped in to fight Bennett, who was assessed a match penalty. "Predatory," is how Sharks coach Peter DeBoer responded, when asked about the Bennett hit. The incident resulted in players from both benches yelling angrily at each other. "They got the lead in a game that got out of hand and it was kind of gutless at the end," said Pavelski. David Rittich, making his seventh start in the last eight, finished with 28 stops to get the win. He improved to 13-4-3. "That might have been the most bad luck I've seen in one game. Even their harmless shots ended up going off stuff and right in the net. Crazy, all-round game," Dell said.